If you’re all about saving the environment, then this is one place you must visit Bangalore’s Rain Water Harvesting Theme Park — it’s got 26 types of rain water harvesting models. Get your geek on guys! 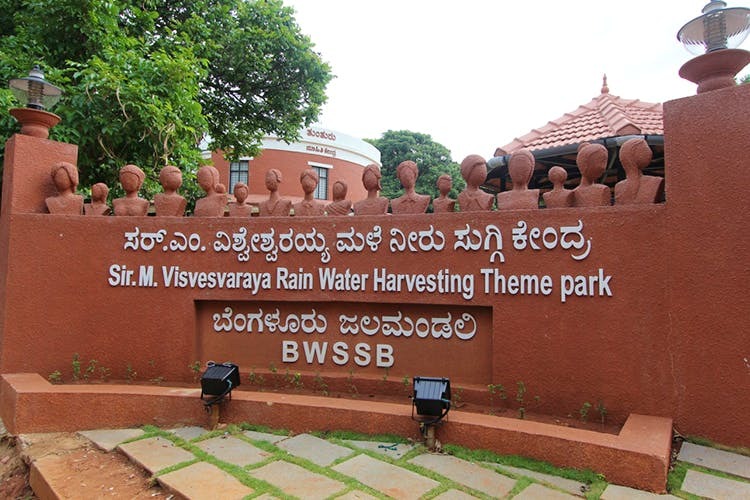 We get more rain than we need, and if you haven’t been to the Sir M Vishweshwaraya Rain Water Harvesting Theme Park, in Jayanagar before, now is a good time to go. Set on a lush 1.5 acres plot of land, it’s not your traditional theme park, but since it’s been built to spread awareness about how you can play your part is saving water, and utilising harvested water easily, it does the job. Just as you enter, there's a small auditorium which screens videos on water saving techniques and judicious water use. While some of the pointers (like turn off the tap when brushing or using eco-friendly modes on washing machines) seem like they’re common sense, they really aren’t because we appear to take water for granted. Once you’ve been reminded about shorter showers and washing cars with a bucket instead of a hose, head off to check out the whopping 26 methods you can save water. Quite a few of the options will need plumbers, pros and a bit of hard work to get going. Like the PVC pipe options which will drain water from higher floors of a building into a tank. But they help you simplify them with options for home. How? Simply put a pipe, or even a bamboo stick from the outlet into the ground, so the ground water level can come up in time. You can even dig a hole in the earth large enough to hold a plastic tank and simply open it out when it rains! Masonry surface tanks, bamboo gutters around roofs and parapets, recharge wells with stones, and creating sunken gardens (so the water flows downwards to the plants) are options that will help, and can be implemented in private homes. In fact, there are a few model bathroom, toilets and home which might inspire you to harvest rainwater. There are pretty gardens with fruits, veggies and flowers — be sure to read what’s written beside them as they’re usually meant to help further with saving water. From which plants to avoid as they soak up ground water, to ones that can survive on minimum water, there’s plenty to learn. Also take a picnic; the amphitheatre area is lovely to sit and have a snack. Now if you’ll excuse me, I’m off to fix my home with DIY rain chains. That’s glasses or tumblers all attached to a chain hanging from the parapets — my own DIY waterfall!